The Washington Business Journal has been reporting the latest breaking business news, with a focus on the companies that drive their local economies, since 1982. 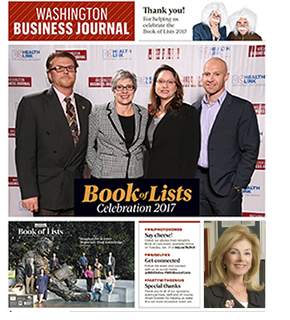 Their Book of Lists provides readers with listings of hundreds of the top companies in their fields. Omega World Travel is proud to be ranked in the following three categories within the Washington, DC area. Omega World Travel has been ranked as the number one woman-owned business in the area for over a decade. President and CEO Gloria Bohan founded Omega in 1972 as a storefront travel agency in Fredericksburg, VA with just one employee. The company has since expanded to 590 employees in offices worldwide, with no changes in ownership. Omega’s growth has been primarily customer driven and accomplished internally, without the distraction or pressures of external mergers or acquisitions. “I’ve learned how important it is to empower my staff and encourage their entrepreneurial spirit. Their creativity and commitment to Omega, along with their great customer service, sustains us and our reputation as a quality company,” says Gloria Bohan. Omega Meetings, Incentives, Conferences, and Events division (MICE) is a one stop shop for all event needs – sourcing, planning, registration website build and incentives. We can assist clients with any portion of their meeting, large or small, or we will gladly manage their entire event. Our many years of experience make us the smart choice for maximizing attendance, revenue and effectiveness of any meeting, incentive, trade show, or conference. “Our approach with Meetings and Events is to create a strategy tailored to each client’s unique goals, then customize each meeting or event to a client’s desired outcome,” explains Joe Margraf, Director of Meetings. In addition to a comprehensive list of meeting services, Omega assists with corporate incentive travel programs and group air fulfilment. Through their subsidiary company, Cruise.com, Omega is uniquely positioned to offer Meetings at Sea as an exciting conference alternative. Omega World Travel is the #11 privately-owned corporation in the Washington DC area. The company opened offices wherever customers needed, resulting in locations across the United States covering every time zone, a European Headquarters in London, England, and several offices in the Middle East. Additionally, their 24-hour emergency center is wholly owned and operated and provides clients prompt customer service and 24-hour emergency travel assistance.